Against this backdrop of monetary failure and technological critique, _MON3Y AS AN 3RRROR | MON3Y.US is an ambitious online survey of net art depictions and critiques of money and its institutions curated by the pseudonymous curator “Vasily Zaitsev”. As well as the work from 70 or so artists invited to participate an open call for work increased the number of pieces in the show in total to around 200. I only consider the invited artists here, but the work in the open call section is well worth looking at as well. The show web site has a simple HTML interface, starting with a single image and a pull-down menu of other works. Disable your pop-up blocker and you’re ready to start. Miron Tee’s “Shame” is the image that fronts the show, an image of a dollar modified to show George Washington peering out nervously from behind the oval frame in the center. Dominik Podsiadly’s “Joy to ide” starts the pull-down menu with a flowing grid of Euro signs on a blue background to the sound of “Ode To Joy” playing backwards. It’s an all-over, closed temporal loop of the kind that animated GIFs exemplify and encourage, the Euro falling forever. Nuria Güell’s “How to expropriate money from the banks” is a more direct action based work of culture jamming explaining presented in a well laid out document in the style of HSBC’s First Direct brand. Paolo Cirio’s “Loophole for All” makes offshore tax havens, those loopholes in taxation regimes that allow corporations and the super-rich to avoid repaying society, available to everyone through a web site interface. 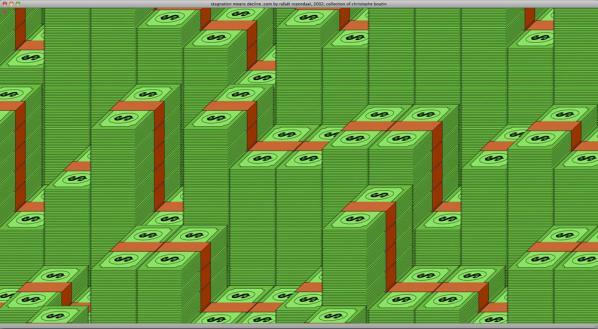 Rafaël Rozendaal’s “Stagnation Means Decline” is a screenful of geometric pixel-art dollar bill stacks that fill the screen with their edges only to be obscured by new columns like an economic game of Life. Filipe Matos’s “Crash” is an undulating animated monochrome concrete poetry American flag with the stars made from the letters of “me” and the stripes as “you”. Adam Ferriss’s “paper$hredder” is a Vimeo video clip of American dollar bills speeding by faster and faster until they dissolve into a blur. Aaron Koblin + Takashi Kawashima’s “Ten Thousand Cents” is a composite image of a hundred dollar bill crowdsourced by paying people a cent to paint each piece through Amazon’s Mechanical Turk service. Maximilian Roganov’s “When the Mao was small, he worked for CIA” is a looped animated GIF colour 3D scan of a dollar bill, polygonally glitched or possibly crumpled over time. Dave Greber’s “Self Portrait With Dog” video is aptly titled, apparently taking place as the custom graphic on a Visa Mastercard. Agente Doble | UAFC’s “Watermark will not appear on purchased artwork” is a million dollar blank artwork if you email them and purchase it, otherwise it’s just a url on a blank web page. JUST DO IT’s “Fifty Euros Inside/Fifty Euros Outside” are animated GIF loops of fifty Euro notes pulsating as if to sound waves on an oscilloscope. Mitch Posada’s “$$$” is a Flash video of Silicon Graphics-era-style VR models of skeletons exploding and morphing into their constituent polygons while texture mapped with Deutschmarks. Emilio Vavarella’s “Money Complex” is a tube map-style world map with banknote-collage continents and a key for numeric labels that can be zoomed in on by moving the mouse to reveal their often incongruous labels. It’s one of the more complex works in the show art historically and conceptually. Lorna Mills & Yoshi Sodeoka’s “Money2” is a Vimeo video loop collage of roughly extracted elements from videos of commodity fetishism, fire and death. Fabien Zocco’s “Cloud” is a generative composition of black dollar signs scattered up over a yellow background over time like a plume of smoke. Jasper Elings’s “Territory” is an animated GIF loop of a dollar bill flag blowing in the roughly simulated wind on a white background. It’s not the only such piece in the show. Robert B. Lisek’s “FuckinGooglExperiment” is online statistical analysis code that tries to correlate the change in Google’s stock price with changes in their PR strategy. It also uses the excellent Fluxus livecoding environment. 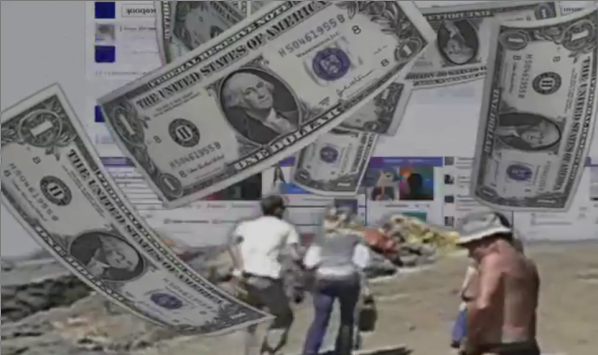 Alfredo Salazar Caro | TMVRTX’s “How to make money on internet remix” is a tightly tiled video loop of a rotating stack of dollar bills in a lava-lite-like flow of colour psychedelia. Anthony Antonellis’s “How to make money on the internet” is simply that rendered block of spinning virtual hundred dollar bills, plucked from the era of RenderWare and VRML. Gustavo Romano’s “Pieza Privada #1” is another piece of net art for sale at a specific price, with a carefully described contract and application form. Tom Galle’s “One Million Dollars For iPhone” is an app available on the iTunes Store that allows you to count a virtual million dollar wad on your iPhone. Geraldine Juarez’s “Love Not Money” tracks the associations of various words with “death”, “love” and “money”. I had to Google this one: it’s a Processing visualisation of a personal stock market tracking the artist’s conceptual assets over six weeks. I love it. Nick Kegeyan’s “C.R.E.A.M. (Cash Romney Eat A Lot of Money)” is simple, direct and effective video burst of an American news interview subject morphing into a cloud of falling texture mapped dollar bills. Dafna Ganani’s “Apple Dollar Explosion” is another descriptively titled piece, a Maya-looking apple texture mapped with a dollar bill spinning against a grey background then exploding into its constituent polygons. Haydi Roket’s “$” takes a dollar bill portrait and literally deconstructs it by pixelating it in increasingly primitive ways, first as 4-bit grey patterns, then in monochrome ANSI characters, alternating to inverse video and changing the contrast to give a flickering effect. Jennifer Chan’s “Infinite Debt” is a video of a twenty Euro not being dipped in batter and fried mixed in with a collage of clipart images and video on the cynical economics of contemporary art and consumerism. Frère Reinert’s “Money as a waste of time” is a deliberate excercise in futility; a blurred, zoomed in silent video of the MacOS X SBOD on a white backdrop. Cesar Escudero’s “Captura de pantalla 2013-03-08 a las 21.46.23” is a Mac OS X desktop image of a gas masked protester who appears to be reaching for a folder named “$$$$$$$”. Jefta Hoekendijk’s “Money Is Data” is an animated GIF loop of a glitchily texture mapped virtual fifty Euro note in artificial colours. V5MT’s “¥€$ or N0T” is a rap video or Designers republic album cover-style animation of monumental metal morphing currency symbols made from struts and spheres like newton’s cradles or molecular diagrams. Addie Wagenknecht’s “How To Make $$$$$” is a grid of money counterfeiting video tutorials, which are apparently a genre. Playing all at the same time they become an all-over aesthetic rather than incitement to a crime. Gusti Fink’s “infinite loop of money drowning in water oil” is a slow, monumental simulation of a platinum visa card sliding into dark liquid that the camera pans over as if it were a sinking ship. Marco Cadioli’s “You are here” shows globe and landscape maps constructed of dollar bills, with a pin or map icon to show your place in the economy. Keigo Hara’s “Making Of Fake Bills” is more halftoned (or possibly shape grammared) dollar bills. 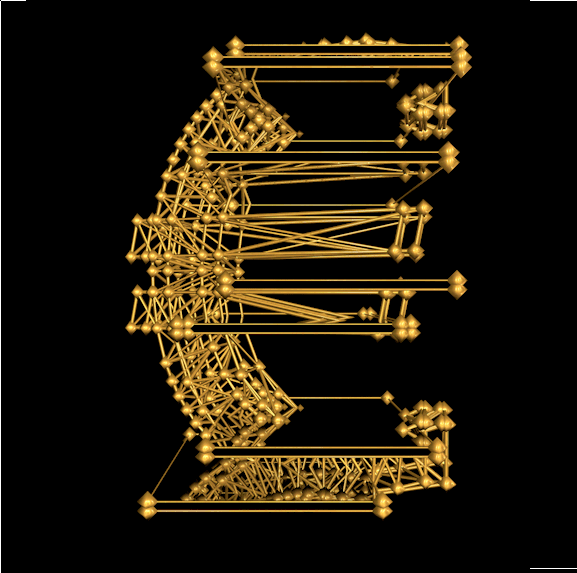 Ellectra Radikal’s “Disolved €uro” is a flickering autotraced, find edged and glitched animated zoom into a hundred Euro note that renders it spatial and architectural. Paul Hertz’s “5,000,000$” it the purest glitch art piece in the show, rows of corrupted and miscoloured banknote imagery that looks like nothing so much as classic street art. Aoto Oouchi’s “It’s all good” is an uncanny New Aesthetic 3d rendering of liquid or possibly mirrored texture mapped banknotes pouring from a wall. Kim Laughton’s “Landscape” is a rendered and collaged landscape of banknotes, resembling nineteenth century engravings of dramatic landscapes thanks to the inconography and texture of its source material. Andrey Keske’s “Tell Me What You Want” is a search engine-style text box prompt that shows the economic coercion inherent in neoliberal use of technology by only allowing you to finish one word beginning with “M”. A Bill Miller’s “3xpl0d3m0n3y” combines a grainy analogue glitch aesthetic explosion of a dollar bill into waveform stripes into a black space of drifting Matrix-green dollar signs. Martin Kohout’s “Watching $100 Note Unveiling Video” has a ChatRoulette look, with the unseen unveiling causing a small smile to break out on the depicted viewer’s otherwise affectless face. Marc Stumpel’s “pH0r 7|-|3 L0\/3 0Ph /\/\0|\|3’/” is a glitched and colourised monochrome television popular music performance from the age of mass media. Again I had to Google it but the song is ‘For the love of money’ by The O’Jays. Benjamin Berg’s “$(0x24)” (the hexadecimal number that represents the dollar sign in ASCII) is a colourful and stripy glitch animation that resembles test cards, 8 and 16 bit graphics, and even woodcut as it breaks down. 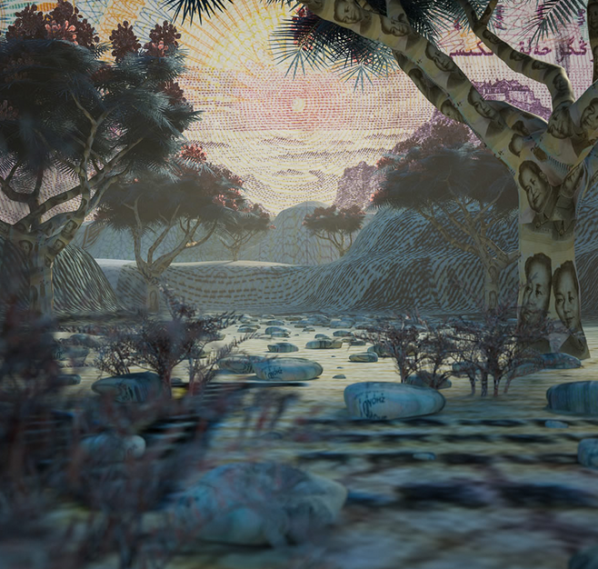 LaTurbo Avedon’s “$$$$$$$$$$$$$$$$$$$$$” is an ambient modern html5 animtion of the avatar-artist reclining on money texture-mapped couches floating up and down a Google image search page for the word “millions”. 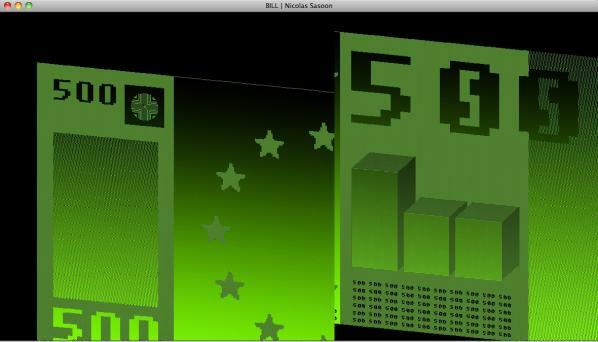 Nicolas Sassoon’s “BILL” is a flickering green screen terminal or slow scan TV-style rendering of a 500 Euro note that plays with the visual language of digital images: the letters and stars are highly pixellated but the backdrop to them is a smooth gradient. Curt Cloninger’s “i want KANDY” loops images of a dancing sniper camouflaged figure montaged with dollar bills and fruit over a more slowly changing background collage of the american flag, a dollar bill, and fruit making a post MTV-styleguide image of the military-economic-entertainment complex. Systaime’s “ʞooqǝɔɐɟ Dollars” video portrays a world where curvily rendered dollar bills rain over an amateur video of tourists at a beach with a sky of quickly cycling Facebook pages. Erica Lapadat-Janzen’s “Money Troubles” is a PhotoShop Pop Dada montage of exploitatively normative female beauty and monetary and drug excess that subverts the imagery of the fashion pages. Milos Rajkovic’s “Mind Wheel” is a wonderfully Gilliamesque collaged animation depicting a mental wage labourer. Émilie Brout & Maxime Marion’s “Cutting Grass” depicts the pointless and trivial labour that video games such as “The Legend Of Zelda force players to engage in for unrealistic rewards such as gold coins and rubies so they can get on with their quest. 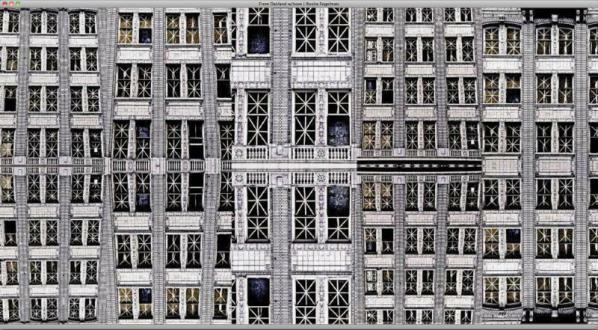 Rozita Fogelman’s “From Oakland w/Love” is a point-and-click kaleidoscopic archtitectural portrait of gentrified Bay Area architecture. Georges Jacotey’s “am I enough political now” is a Chatroulettish video selfie of an augmented reality Euro flag and symbol drawing and dancing session. Δεριζαματζορ Προμπλεμ Ιναυστραλια’s “Major Problem” is a rendering of a stack of dollar bills as seen through heat haze or under water, rippling and undulating against a white background. 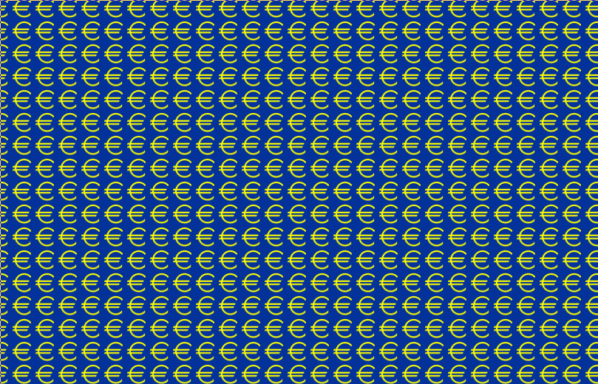 Lars Hulst’s “0 €uro” is a rendering of a zero Euro note. Nick Briz’s “a return to secularism” is a video documentary of twenty dollar bills being printed with the words “a return to secularism” flashing over it, framed by a repeated loop of the words “in God we trust” being crossed out on a dollar bill where they were added in the 1950s. Jon Cates’s “MØN3¥-Δ$-3ɌɌɌØɌ” is a Classic Mac monochrome bitmap or fax aesthetic PDF essay for the show and an exposure of the print on demand economics of that essay in the same style. 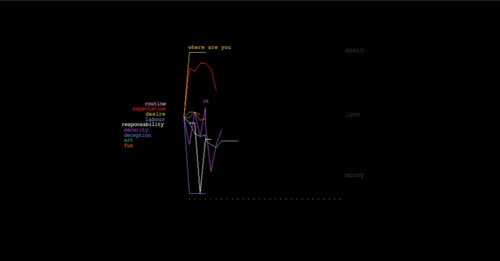 León David Cobo’s “Conversation With Machine” has a 1990s broadcast graphic feel, showing the soundwaves of the feedback of a conversation with Siri asking it for money in Euro blue and yellow. 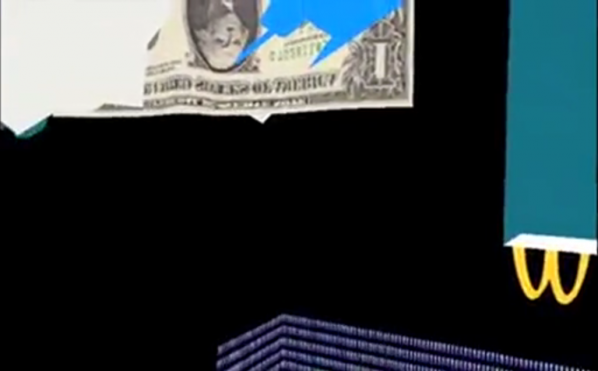 Guayayo Coco’s “Money | GLıɫcʜ ᴬᴺᴰ GLıɫɫɛʀ” is a video of a journey through a VRML-style virtual environment of discrete polygonal objects texture mapped with dollar bills, corporate logos and more abstract patterns with a radio channel-surfing soundtrack. Vince Mckelvie’s “MONEY” is a reactive interactive deconstruction of a hundred dollar bill into a grid that reacts to the viewers’ mouse movement, revealing pulsating colours behind. It’s a good example of how suitable html5 is for this kind of thing. Ciro Múseres’s “YOU HAVE WON” is a classic net.art style HTML bomb of overlaid text and links with content from financial web sites such as Barclays, Halifax and Santander that continuously adds and removes layers in different shades red, black, blue and green text to make new compositions. Adam Braffman’s “Money Loading” is an animated GIF of the frame of a 100 dollar bill with a “Loading…” speech bubble in the centre. It makes the show’s themes of absent and delayed wealth more obviously explicit. Rollin Leonard’s “Portrait of a NetArtist” is an two-frame animated GIF of the artist naked in the bath with bundles of fake hundred dollar bills with which they are lighting their cigar. Thomas Cheneseau’s “100€ sequence” is a grid of glitched sections of a hundred Euro note that moires with colour as you scroll it. There’s a link to the facebook album that constitutes the actual work, and it works much better as a clickable album than as a static single image. Yemima Fink’s “This is not money” is an abstract postmodernist collage of graphical quotations from the counterfeit-resisting elements of banknotes that is both witty and a very effective defamiliarisation of the iconography of banknotes and the power that they represent. Mathieu St-Pierre’s “Untitiled” is a glitched jpeg of a dollar bill that in its straightforward application of glitch aesthetics makes the most direct link between them and the economic “glitch” of 2008. Kamilia Kard’s “Amazon VIP girls” is the lone tumblr in the show, with an aesthetic that is either post-internet or pre-Google depending on how old you are applied to the supposedly perfect clothing models used by web sites. José Irion Neto’s “Untitled” is a glitched banknote that turns JPEG artefacts into Klimt patterns. This historical, formal and genre coverage of the variety of artworks included in the show comprehensively illustrates the chosen theme of “money and error”. This creates its own genre and lineage for the included artworks, which gain by comparison to their newly identified peers. They also contribute to the social and economic critique of the show. It’s a very successful balancing act, which the simple interface and presentational strategy of the show’s curation are key to achieving. _MON3Y AS AN 3RRROR | MON3Y.US is an almost overwhelmingly successful in its comprehensive review of net art’s critical depiction of and engagement with money. By taking a technologically simple but historically, conceptually and logistically ambitious approach to net.curation for net.art it demonstrates the effectiveness and lasting value of net art’s contributions in this area and the power of online thematic curation to draw together and contextualise this value without giving in to the often perceived need for offline institutional underwriting.